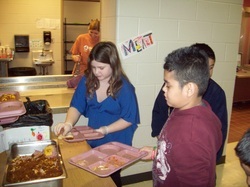 Jackson Elementary School has a Habitat Club that meets weekly for one hour after school. 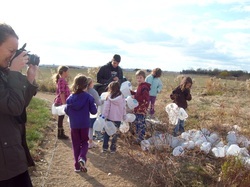 * learn about the wildlife in the habitat. * teach others in their classroom what they have learned. * help maintain the habitat. 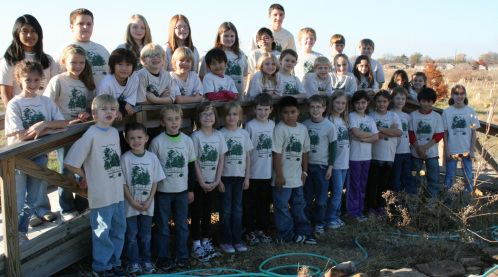 Thirty new Habitat club members are chosen each fall from the school population. The children must apply, and the classroom teacher must recommend the student as being responsible. 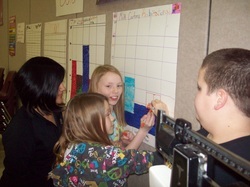 The students are then selected, with every attempt being made to select at least one child from each classroom. Students from grades 1-5 are eligible. If a child has three unexcused absenses from club meetings they are no longer able to be in the club and a new member is chosen. Members in good standing are given first consideration for membership the following fall, to allow for leadership roles to develop. 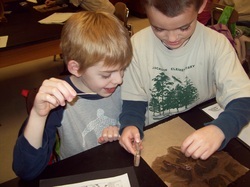 These two boys are looking at the body parts of a worm that was taken from our vermicomposting bin. We are using worms to eat some of our food waste and turn it into good soil.